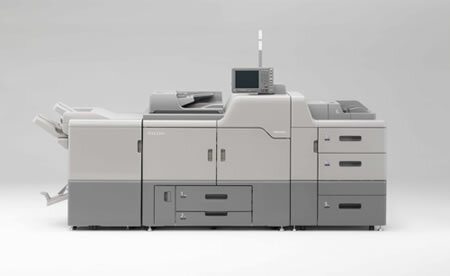 Ricoh has launched three new digital color presses: the Pro C651 EX and C751 EX (scanner version) and Pro C751 (printer version). They run at a maximum of 65 and 75 pages per minute respectively. According to Ricoh, these products are completely new, and are not slowed-down versions of the C901s, the manufacturer's top-of-the-range production digital machine. However Ricoh are certainly capitalizing on some of the technical innovations brought to the market in the C901s: notably, media management and better quality. The three new machines will have to measure up to the competition, such as the Canon ImagePress C6000, the Konica Minolta bizhub PRESS C6000 / C7000, or the Xerox DCP 700.